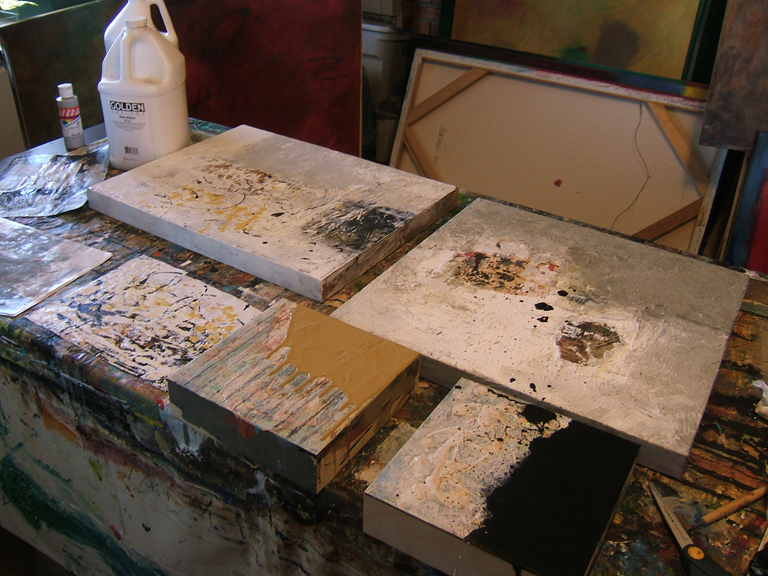 This morning turned out to be a joyful smearing of paint – on canvas, on panels, and all over my hands. I had spent way too many hours this week at the computer working on digital art, which can be addicting in its own way, but can be physically draining too. It’s good to change focus for a little while. I finally broke out of my fear of going larger with some collage on canvas. Well, I guess you can call it collage, though for now it’s mostly paint, and lots of texture. I want to shake my fixation on the idea that canvas=paint. The collage elements of weathered and hand painted papers that you do see are partially obscured by a blending around the edges into the surrounding paint. 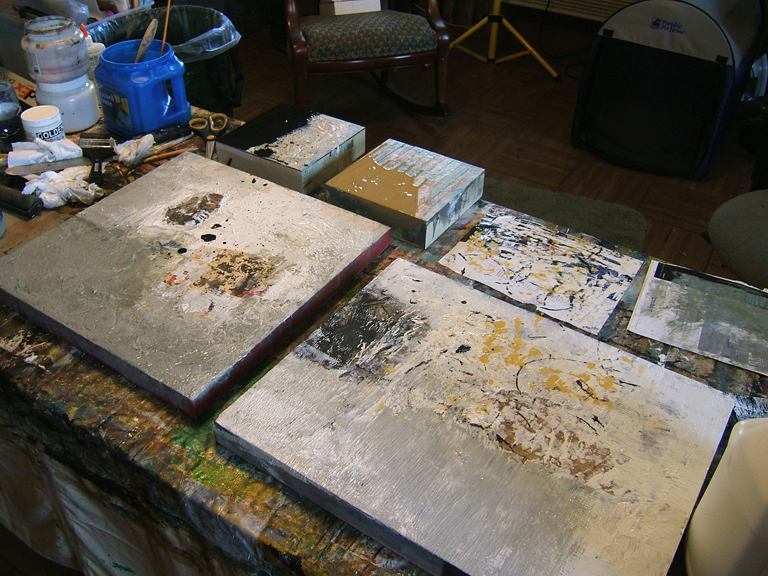 Alongside these two canvases you will see two of my boxes with ongoing work. And you might notice the magazine pages that I’ve used to clean the paint off my knives and brayers. I’ve taken two shots, each from the opposite side, for a better view of what’s going on so far. These canvases aren’t the really large ones, of course, but I thought maybe it was best to make a gradual transition to larger. But those old canvases are right there waiting to be next. I do too, Deb! It’s a never-ending fascination. love where these are going so far. Wonderful effects and I’m liking your colour combos. Looking forward to a closer look as you develop all of these. Love what you’ve done with those boxes too, the black very dramatic. Thanks, Bren. The box with the black is going to be tricky to resolve, because I liked it before I worked on it again. So I don’t want to destroy what I had. Everyone tells me I need to work larger but frankly all that empty space scares me to death. I’ve put work together to form triptychs but that’s cheating. I think working your way up in size is a good solution. I’m getting ready to make two large pieces for over my bed. You’ve inspired me to get to it. Margaret! I’m so glad I’m not alone. I’ve done large scale paintings in the past, but not incorporating some of the collage elements that I’m now doing. Why is this so hard? It’s a mystery. Honestly, I have in my mind the idea of scaling up an actual drawing of one of my collages and then reproducing it any way I have to. If there is printed imagery or text, I’ll enlarge that and paint it. I think that might break through the hesitancy I have with it. Good luck with your experiment. I’d love to see the result! Angel, thanks for the introduction. I appreciate your taking the time to comment. It’s great to discover you and your art. Keep up the good work!